Because of its historic breeding range, Kirtland’s warblers were never numerous, but by the time Leopold and his party visited its nesting grounds that summer, they were aware of its unusually low nesting success. The flawed young genius was the first to attribute sagging population numbers to nest parasitism by brown-headed cowbirds. Brown-headed cowbirds are brood parasites, meaning they do not build their own nests or raise their own young. This survival mechanism, developed as they followed buffalo across the vast prairies of North America in search of food, has proven to be a challenge for many avian species – especially small songbirds like warblers. Each cowbird hen lays up to 30 eggs in the nests of other species each season, typically resulting in the host parents raising a single cowbird. The host’s youngsters rarely survive, resulting in declining populations for many songbirds. For some species, including Kirtland’s warbler, brown-headed cowbirds are a relatively new challenge in our state as they were rare until the forests were cleared. Nathan Leopold was correct in his assertion that cowbirds were adversely impacting nesting success of the Kirtland’s warbler. Although the Endangered Species Act was not enacted until the end of 1973, the U. S. Fish and Wildlife Service listed the bird as endangered six years earlier. By 1971, only 201 male Kirtland’s warblers were counted. By then, cowbird parasitism was widely believed to be the problem; thus the Service began trapping cowbirds the following year. With that effort, nesting results rose from less than one fledgling per nest per year to nearly three per year. In spite of that, however, the overall population numbers remained stagnant. They even declined. From 201 males counted in 1971, the number slumped to a mere 167 in 1987. With cowbird trapping well underway, it was clear that brood parasitism wasn’t the only problem for the bird. The Kirtland’s Warbler Recovery Team was formed as a result of the passage of the Endangered Species Act. The team brought Federal and State agencies together to, among other things, manage the bird’s habitat. 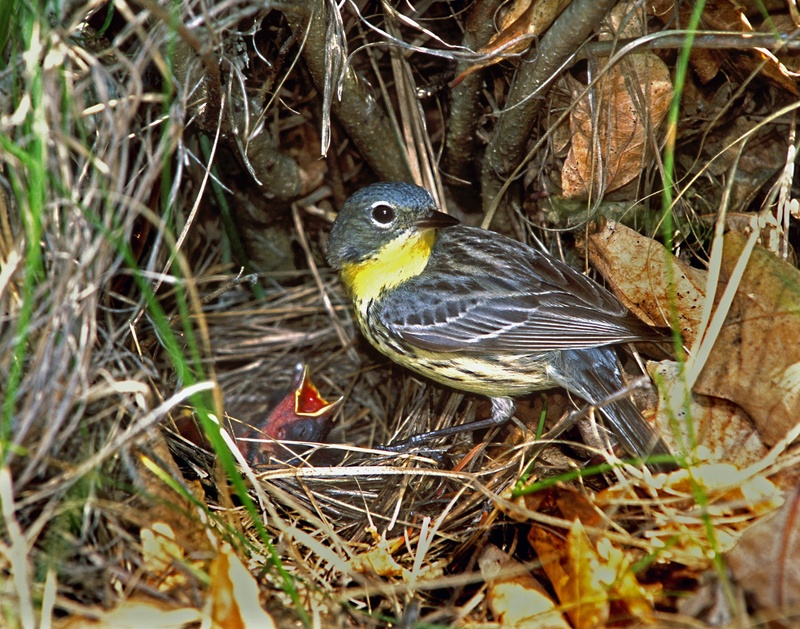 Although it was well-known that Kirtland’s warbler nested only on jack pine barrens, further strict habitat requirements were not well understood until a deadly controlled burn got out of control in 1980. Initially, population numbers continued to drop until the 1987 low. Then they began to climb. It was an uneven, but steady increase. This year more than 2000 males were counted in Michigan. After ninety years of tracking, studying and attempting to aid this iconic breeding bird in our state, just how was that accomplished? Find the answer next time.